Lora Meerdo received a B.S. in biology from Alderson Broaddus University and an M.S. in animal reproductive science from Utah State University. After completing her M.S. she was part of the USU team that worked with the University of Idaho to clone a mule. 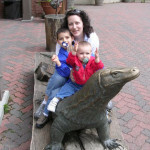 Lora is currently a home school mom to her three children, she serves as a volunteer leader of a local support group for families that have an individual with a disability and works at the Willow Park Zoo in Logan, UT. Lora lives in Hyde Park, UT with her husband Andy and their children Zachary (del +), Corban and Rosalie.